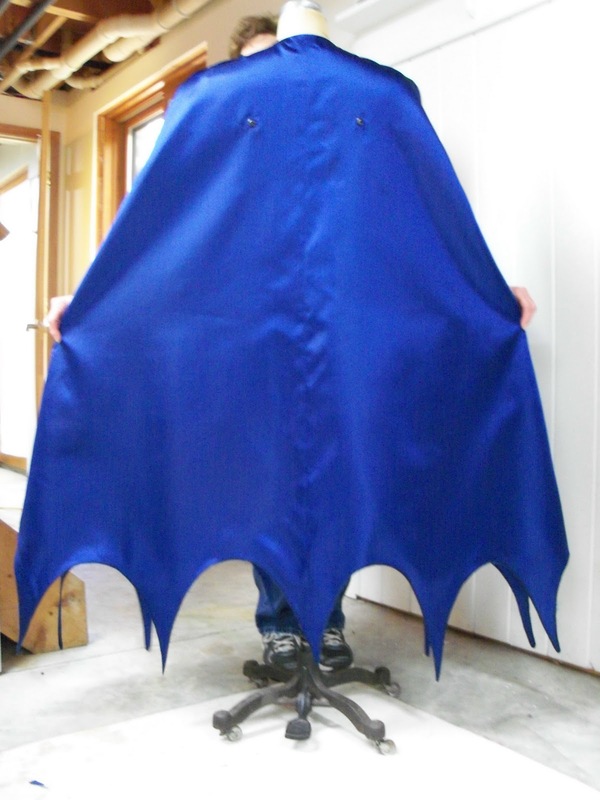 As you can see the cape is not particularly full and the pattern fits a 40- 42″ chest. If you are larger then this you will want to alter the pattern to fit your larger chest size. Today I will show you how to accomplish this. This shows the back of the cape in the Poly Satin. Measure around your chest and arms to get a width measurement. ♦ Tape – My preferred tape is soft cloth tape as found in the pharmacy/bandage section. It does not tear the tissue, remains flexible, and can be removed if needed. To begin remove your cape front and back pattern pieces from the tissue. You do not want to cut out on the line, but just around the pattern pieces. Press them to remove any folds and wrinkles with a dry iron. 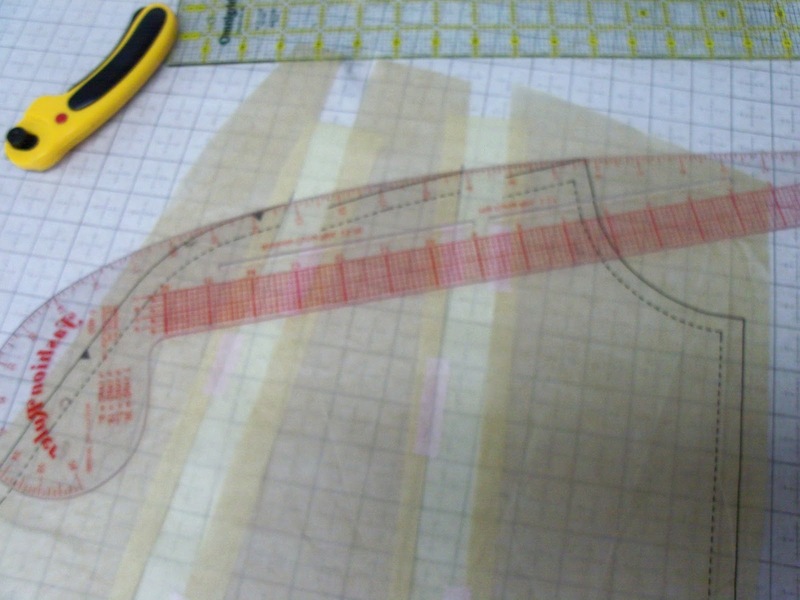 Fortunately for us I have a client I am currently making a cape for and so we will use his measurements as an example, but you will of course need to adjust accordingly. My clients chest/arm measurement is 62″ which means we need to add 10″ in width and we need to make it 1/2″ longer. To maintain the correct look of the cape you need to add evenly around slashing and spreading through the center of each hem scallop. Mark a line(indicated by the blue vertical lines above) that begins at the mid point of each scallop and extends up through the shoulder line. One of these lines will run along the dotted stitch line at the side seam. Mark another line(shown in red) perpendicular to the grain line(short black line) on the pattern. Repeat this for both front and back pattern pieces. Let’s now determine how to divide the amount we need to add to our circumference. Half of the pattern has 5 hem scallops and so I divide my 5″ by 5. 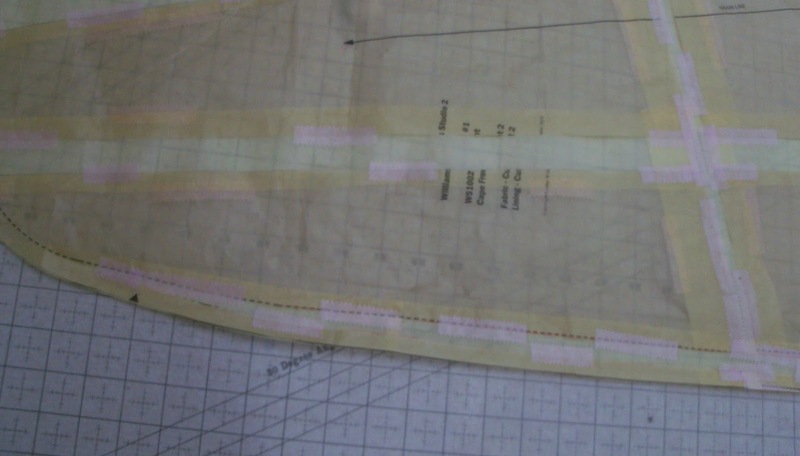 The scallop along the side seam falls into the center, so we will add 1/2 the total between the 2 side seams. For me this means 1/2″ along each side seam, adding 1″ total. 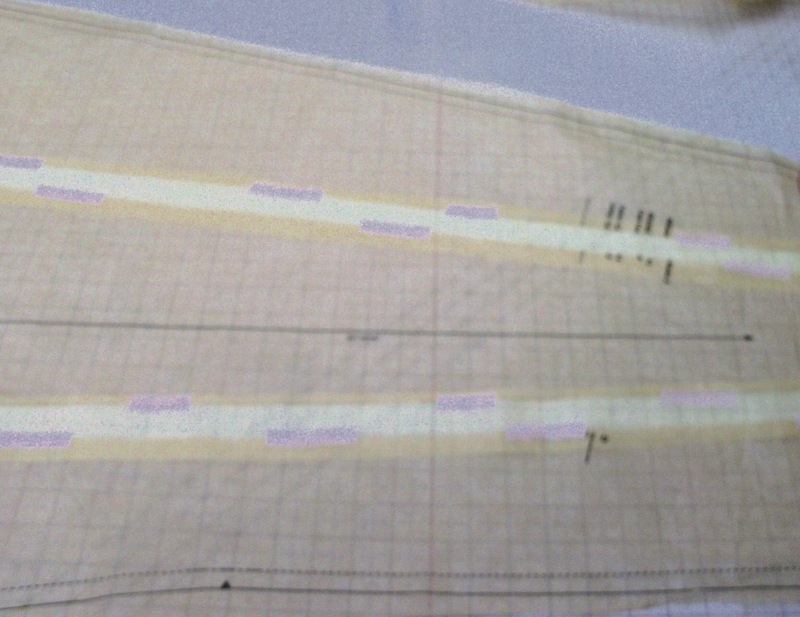 Still with me…..Cut narrow strips of your extra paper. I had some Golden Threads in the studio so I cut narrow strips that were slightly longer then the length of the pattern. Cut your pattern along one of your blue vertical lines, tape a narrow strip of extra paper along one edge. Extend your Red line across the strip and place a cross mark the amount you need to spread. That is 1″ for me. Tape your pattern back together maintaining the correct spread width along the length and being very careful that your red line remains straight as well. Once you have taped the front, turn the pattern over and place tape along the back of the pattern as well. Repeat this step for the 4 blue lines that run through the body of the pattern. Your shoulder line will be all a jumble now, so you need to redraw it, or blend it. 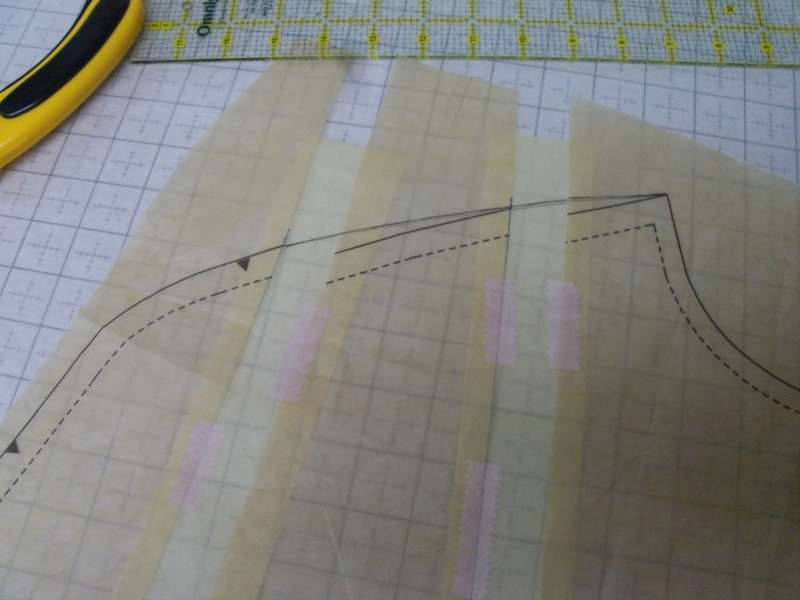 This is where a fashion ruler can come in handy, it has a nice gentle curve on it for pattern drafting. Next we need to lengthen or shorten our cape. If you are lengthening you will cut along your red line and spread it as you did the others the desired amount. For my cape that was 1/2″. To shorten draw another line above your red line the amount you need to shorten the cape. Now fold the red line up to the new line and tape securely. 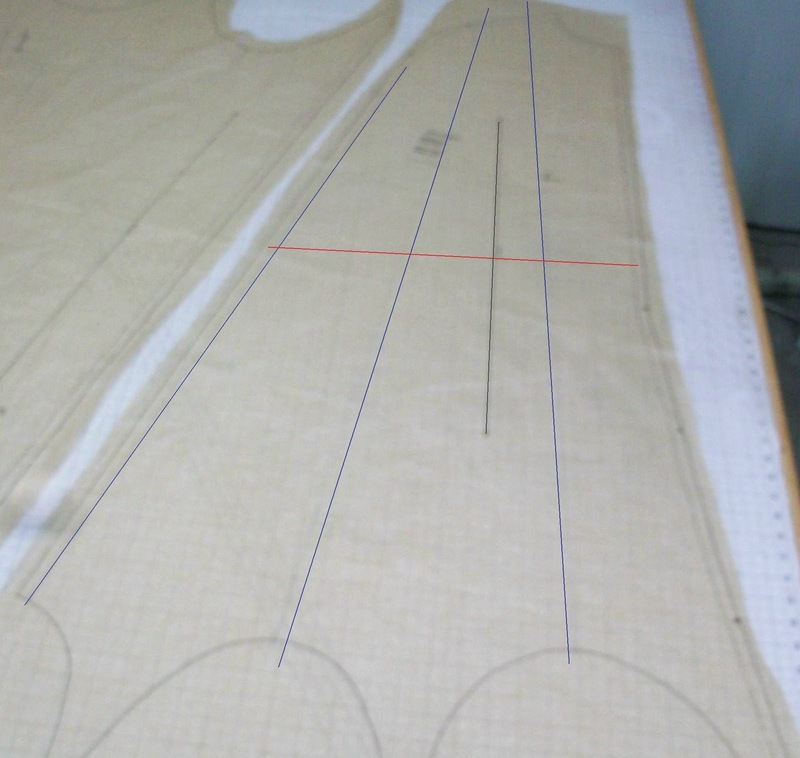 Once the length is adjusted we can finish spreading our pattern by cutting along the side seam stitch line, starting at the bottom and cutting up to the shoulder curve point. Do not cut through the pattern here, but leave a hinge so that you can spread the seam open the desired amount. That is 1/2″ for me, or half of the total amount you did on the other spreads. Congratulations on altering your cape pattern. If you have any questions please feel free to ask and I will do my best to answer them for you promptly. 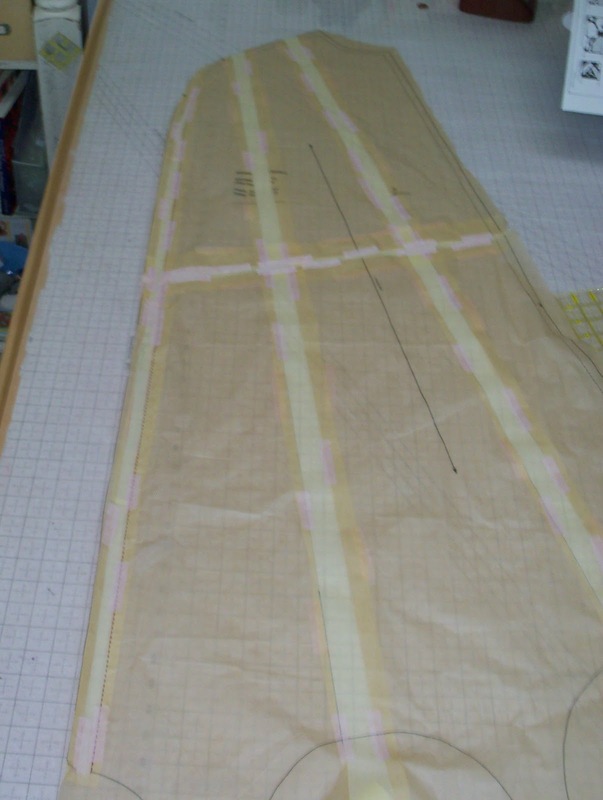 Now that you pattern is ready I highly recommend you cut it out and sew it up in muslin or waste cotton so that you can make sure the width and length are correct for you. You do not need to sew up the lining, a single layer should give you a good idea of the over all fit. Remember the front of the cape does not overlap at the chest. I wonder if you do any orders for making the capes and rest of the costume ?